Accra, July 9, GNA – The 29th AFRA Regional Technical Working Group Meeting opens in Accra with the aim to review and propose actions for a re-examination of the AFRA agreement and guidelines. Mr Sabbiti Baguma, Chair of the African Regional Cooperative Agreement for Research, Development and Training Related to Nuclear Science and Technology (AFRA), said AFRA’s periodic accession clause was hampering governance of the group. He said the periodic accession, which requires renewal of membership every five years, was affecting the governance of AFRA, especially in regard to membership and ownership. He said the fifth extension of the AFRA agreement will expire on April 3, 2020 and would be extended for further terms. 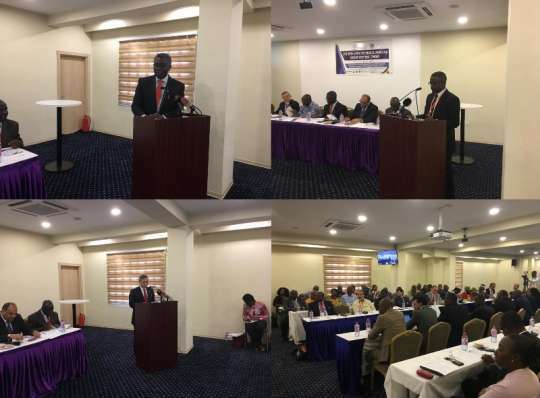 Mr Baguma made the statements at the opening of the 29th AFRA Regional Technical Working Group Meeting organised on behalf of the government of Ghana by the Ghana Atomic Energy Commission, in collaboration with the International Atomic Energy Agency (IAEA). The meeting will run from Monday July 9th to 13th, 2018. “Therefore it is of great importance that we reflect on the AFRA agreement, guidelines and procedures and propose actions for consideration by the meeting of Representatives,” he stated. He also stated that the meeting will also consider some key deliverables, which had been initiated and finalised by AFRA committees after the 28th Technical Working Group Meeting to provide conclusions for final consideration by the Meeting of Representatives to be held in September. These key deliverables include the preparation of the third regional strategic cooperative framework for 2019-2023, which needed to be finalised by the meeting. Mr Baguma said in spite of an increase in the number of regional experts, supporting AFRA activities over the years, there was still room for improvement. There was thus a need for concerted efforts to shape the AFRA programme to areas of common interest to optimise the utilisation of available resources, with a strong component of human resource development commensurate with the advancements in nuclear technology within the member states. Professor Kwabena Frimpong Boateng, Minister for Environment, Science and Technology, in his keynote address, said the core function of the AFRA Agreement, which was to develop and implement appropriate systems for human resource development, nuclear knowledge management and preservation, and skills acquisition and retention, was in sync with Ghana’s programme of putting the development of science and technology at the centre of national development. He noted that the government’s intention to increase the budgetary allocation for Research and Development, would help to invest in the training of human resources, especially in nuclear energy, which was critical in the quest to catch with the world and reduce poverty. He urged AFRA and the IAEA to continue to support Ghana’s journey to adding up nuclear energy to its energy mix. He also supported the call to review the AFRA agreement and guidelines to amend the practice of member states having to accede to the agreement every five years. “I think that membership should be in perpetuity unless a country decides otherwise,” he said. Mr Dazhu Yang, Deputy Director General of the IAEA, encouraged participants to examine how AFRA could adapt and transform, creating a simpler and more robust framework to its state parties to benefit from nuclear science and technology for development, since a lot had changed since AFRA was created in 1990. He also encouraged them to align their programmes with the Sustainable Development Goals and the African Union’s Agenda 2063 and to focus on measures and actions that will result in concrete impact on sustainable development in the region.